When rare and classic cars have a high value historial indeed sometimes can be sold and the price is unreasonable. 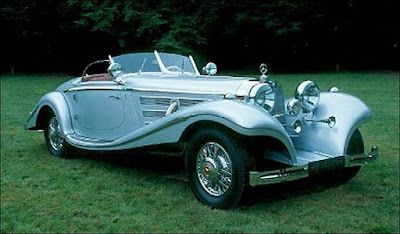 Just as with a Mercedes 540K Special Roadster is believed to have been used by Hermann Goering, one of high-ranking Nazi officers who is very close to Adolf Hitler. As quotes from The Sun on Tuesday, January 12, 2010, when Nick Szkiler heard about an armoured classic sports car rusting away on a Russian farm, he was immediately approached and found the shell of an almost identical 1942 cabriolet Mercedes. He believed to have belonged to Hitler’s second-in-command Hermann Goering, especially the car's original color was Goering's favourite aviation blue could still be seen. Nick has been asked to find a buyer. He said, "There’s little doubt that this was also Goering’s. It would take at least a seven-figure sum to recondition it, then it’d be worth £12 million."